SS8 0119 leaves Beijing station with an unidentified passenger working on 23 February 2006. Every morning the Chengzihe systems locos gather at Dongchang for servicing and to pick up a fresh crew. 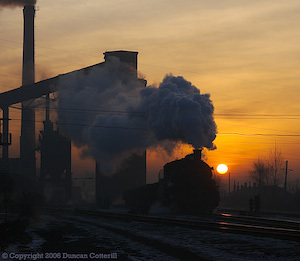 SY 0237 passed the loader at Dongchang as the sun rose on the morning of 28 February 2006. 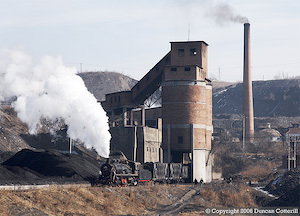 SY 1340 digs in as it climbs away from Hengshan with a rake of empties for one of the collieries east of town on 27 February 2006. SY 0951 moves it's rake of wooden bodied hoppers under the loader at Qikeng colliery on 3 March 2006. SY 1446, still coupled to its train of side tippers, takes water at the servicing point adjacent to Didao washery on 4 March 2006. Preserved QJ 6800 "Iron Bull" is housed under an ornate canopy inside Jixi Diesel Depot. Entry to the depot was refused. SY 1486 had been dumped out of use at Jiaojie Ironworks since a DFH5 diesel was acquired in late 2005. The loco carried the fake number SY 1588. DF8 0085 and DF4 7201 worked a heavy coal train west near Pingshan, on the Mudanjiang - Harbin main line on the morning of 06 March 2006. This line links the Jixi coalfield with the major cities of the north east. 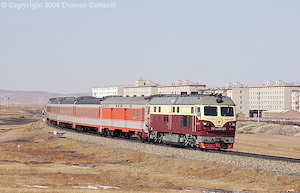 DF4D 0107 approached Zhalainuoer with train 1302, the 13:20 Manzhouli - Beijing passenger on 10 March 2006. Our visit to Zhalainuoer coincided with that of a Chinese film crew. The horses were film extras waiting for their moment of fame but the engines were real. SY 0958 and SY 1257 posed for the camera on 08 March 2006. A shortage of CNR wagons brought coal mining to a halt on the afternoon of 10 March 2006. Fortunately for us the spoil trains kept running, giving us plenty to photograph. An empty spoil train drifts into one of the reversing stations as a loaded train blasts out. SY 1416 is the star engine on the deep mine system and is fitted with full size deflectors giving it a passing resemblance to an SL6 pacific. 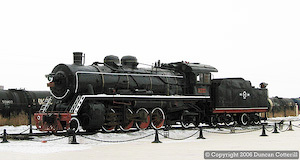 JF 1861 is plinthed next to the Russian border crossing west of Manzhouli. In the background a train of 5' gauge oil tanks passes behind a Russian 2TE10V diesel (out of the picture). DF11 0315 & DF11 0062 run into Beijing's main station on 11 March 2006. The DF11 is a powerful, modern passenger locomotive with a maximum speed of 170 km/h and can be seen on many non-electrified main lines. This report details a photographic trip to some of the last steam worked industrial railways in north-east China. Our group comprised Peter Breeze, Bryan Acford, Jim Livesey and myself with Robin Gibbons joining us for the first ten days. Arrangements within China were made by ace guide and famous photographer Sun Xiaolan who accompanied us throughout. Although our prime interest was steam, we fitted in a bit of modern traction photography as well when time permitted. Our route took us by rail from Beijing to Meihekou for the steam worked colliery system there, then on by train to Mudanjiang via Shenyang and Harbin. The five colliery systems around Jixi kept us occupied for a whole week before we left by rail for Harbin. 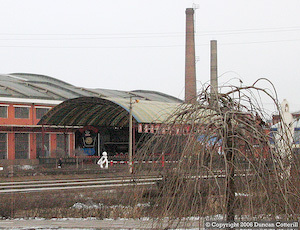 A day exploring in the area east of Harbin turned up a new steam location but three months too late. From Harbin, we took the train north west to the opencast mine at Zhalainuoer (Jalainur) before returning to Harbin and then flying back to Beijing. The main group flew from various airports around the UK to Paris and then continued with Air France to Beijing.Arrival was on time and we completed the formalities within an hour of landing. Outside, we met Xiaolan and travelled to the Dongnan Jiaolou, the restored watchtower on the city walls near Beijing station. We eventually found our way to a spot where we could photograph departing trains. The park Robin Gibbons visited at Christmas 2004 is now on the wrong side of a high fence, making photography impossible unless you have a stepladder, but there are shots from the adjacent roadbridge. In less than an hour we saw locos of many different classes including BJ, DF4B, DF4D, DF7G, DF10F, DF11, DF11G, NZJ2, SS1, SS3, SS8 and SS9G and photographed a number of them before clouds obscured the sun. After a break for lunch we met Robin and went to the station to catch train 2537, the 14:10 to Tonghua, which we rode as far as Meihekou. Passing Beijing loco depot, locos of classes BJ, DF4B, DF4D, DF7G, DF10F, DF11, DG11G, DF11Z, ND5(! ), SS3, SS8, SS9G were seen, including BJ 2003, 2004, 2005, 2008, 3117, 3223, DF10F 0001A, 0001B, DF11Z 0001A, 0001B, 0002B, ND5 0221. There were also a number of withdrawn BJ and NY7. Further out, at Beijing Dong, DF4 0041 was passed (the old green one, not the deceptively numbered DF4D) and at Yanjiao NY7 0029 was stabled on the empty stock for K53, the Beijing - Shenyang overnight express! Most freight on the line to Shanhaiguan via Fengrun was SS1 hauled. 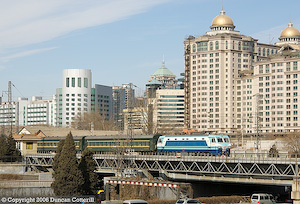 Passengers were a mixture of SS9, DF4 and DF11 including a train with a DF11Z pair on distinctive white and turquoise coaches, seen east of Fengrun, and an SS1 hauled local passenger. Between Changli and Zhangjiazhuang we passed over a colliery system where Bryan and I had seen a train hauled and banked by SYs in March 2003 but hadn't been able to pinpoint subsequently. I'd assumed that this was part of the Tangshan / Kailun system but it's actually much further east than that. 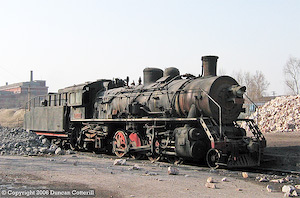 The shell of a DFH1 is still in the depot at Shanhaiguan. After Shanhaiguan, it quickly got dark and the jetlag took over. No more observations were made before Meihekou, by which time an orange DF4B was hauling our train. Passenger services were being worked by the diesel but all coal traffic was SY hauled. 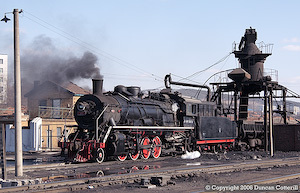 Locos SY 0791, 1217 and 1564 were in use. SY 1216 and 1662 were cold but serviceable inside the shed and SY 1445 was dumped outside. This loco has 1974/10 plates on both sides, which doesn't fit with it being 1445 and it's coupled to a tender marked SY 1564. From Yijing, trips to Heishantou were noted at 07:55 and around 13:30. There were arrivals from Sijing and Sanjing before the 07:55 departure and empties to Sanjing at 09:20. On 24 Feb, the early afternoon was very quiet but as the weather had deteriorated we returned to Meihekou to try and check out the QJ reported to be plinthed at the CNR depot. Unfortunately we were refused entry and were unable to confirm its existence. The following day we passed the depot on the train and again saw no evidence of a plinthed loco. The traffic pattern on 25 Feb was similar to that on 24 Feb but the weather was far worse. It snowed all day and there was never any prospect of the sun coming out. By late morning we decided to abandon Meihekou early by train rather than risk a journey over treacherous snow covered roads to Siping. I can confirm that there is only one diesel here and it's the same one that we saw in March last year, a DFH5 numbered 4010 at the ends and on one side and 0104 on the other side. Train 4264 left Meihekou at 13:13 behind an orange DF4B. We had managed to get into the single soft seat coach thanks to Xiaolan's efforts and enjoyed a relaxing journey to Shenyang Bei. The route is quite scenic but the lineside is heavily overgrown, eliminating virtually all photographic potential. Most freight traffic was worked by Meihekou based DF4C including 4035, 4042, 4044, 4053, 4353, 5220, 5221. South of Qingyuan there were also some Shenyang Xi based DF4B including 1032 and 1530. Passenger trains were worked by orange DF4B including 2194, 2437, 2490 and green DF4B 1525. We continued from Shenyangbei to Mudanjiang on train 2017 at 19:00. SS9 0043 was on the front out of Shenyang and presumably worked all the way to Harbin where a DF4D took over for the run to Mudanjiang. DF8s dominated freight workings on the last leg with DF4DKs on passengers including some very lowly locals. The Mudanjiang - Harbin rapido, N2, was worked by a DMU set. We continued from Mudanjiang to Jixi by road. Our original plan had been to spend four days here but when our visit to Huanan fell through (see below) we decided to stay for another three. With five active railway systems, there was plenty to keep us busy when the sun was shining. Although the weather was very mixed we managed to get some good shots every day although it was sometimes a struggle and there were long cloudy periods and snowshowers to contend with. Contrary to one recent report, we found virtually everyone extremely friendly and were regularly invited to shelter from the cold in pointsman's huts and crossing keepers cabins. Information on anticipated workings was freely given and nothing was asked in return except the for the occasional photo or foreign coin. We spent most of 26 Feb on this system around Dongchang yard and Beichang washery. Although virtually every loco appeared to be facing in the wrong direction when we arrived, they quickly sorted themselves out and we got some excellent shots in the afternoon. SY 1344 spent the whole afternoon shunting the output side of the washery while SY 237 worked in from Dongchang several times on coal hoppers and SY 1058 took spoil out to the tip. SY 0590, 0733 and 1544 were also seen. 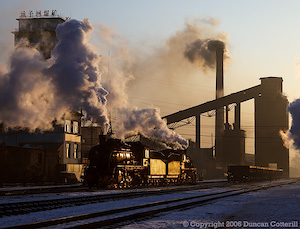 The first destination on 27 Feb was Dongchang yard where there was plenty of activity in the early morning light. SY 0237 was still employed on the shuttles to Beichang but was now facing the wrong way round. SY 1058 worked the spoil trains again and SY 1344 brought a long rake of empties in from CNR. Several other locos appeared light engine including SY 0863, 0733, 1018 and 1544. Previous reports of SY 1018 being dumped were clearly wrong. Later in the day we had a look at the line out to Zhengyang, which is roadside most of the way and not particularly photogenic. For several km out of Dongchang it runs in parallel with another line that then branches off to a spoil tip and possibly another mine to the north-west of Zhengyang. This branch is shown on the schematic diagram of the system Bernd posted a few years ago. The spoil trains from Beichang and the mines use this line to get to the spoil tip. The line from Zhengyang to Xinghua looks much more interesting as it climbs away from Zhengyang around a hillside and appears to continue climbing most of the way to Xinghua. The line is longer than it appears on Florian's map and twists around much more. Xinghua is close to the main road east to Donghaikuang. Both Xinghua and Zhengyang have active narrow gauge electric systems. We paid another visit to Dongchang early on 28 Feb and found SY 0237 and SY 1058 working spoil, SY 1344 on the coal hoppers shuttling between Dongchang and Beichang and SY 0733 and SY 1544 on a very long loaded train from one of the mines at the far end of the system. A similar visit on 01 Mar produced SY 0237 and SY 1058 on a loaded train from the east to CNR and SY 1544 on spoil. SY 0863 and 1344 were also seen. On 02 Mar the morning line up at Dongchang was very impressive with SY 0733, 0863, 1058, 1351 and 0590 all waiting their next duties. SY 0237 and 1344 also made appearances. SY 0863 took a long train of empties out to Xinghua shortly after the shift change and was photographed storming up the bank out of Zhengyang at 08:45. SY 0733 followed soon afterwards on a train of spoil tippers. The early morning session at Dongchang on 04 Mar was also busy with SY 0237, 0590, 0733, 0863, 1058, 1344 and 1351 in attendance. However, by late morning the system was very quiet with few workings and long gaps between trains. Our final dawn visit on 05 Mar found SY 0237 ready to leave Dongchang on loaded hoppers just as the sun rose. By 06:00, the show was all but over as the smog drifted in from the town. The same seven SYs as the previous morning were seen. We visited this line on the morning of 27 Feb and witnessed the morning procession of trains from Xinhengshan climbing the bank to Zhongxin. As last year, each train was short and single headed with no banker but there were lots of them. The show started with SY 0746 about 08:20 followed by SY 1340 at 08:35, SY 1095 at 09:35, SY 1369 around 10:10 and SY 0746 again at 12:40. SY 0804 was seen returning to Xinhengshan around 12:00 so must have gone up the bank sometime after 09:30 while we were further east. On 28 Feb the first working up the bank was SY 1095 light engine at 08:45, followed by SY 1369 and SY 0746 double heading at 09:08, SY 0804 at 09:21 and SY 1340 at 09:29. SY 0898 was working Erchang mine and collected a long train of empties for the mine from the CNR yard at Hengshan at 09:35. About half the train was left part way along the branch where coal was being loaded from road vehicles. The loco then continued to the Erchang loader with the remaining wagons. We visited Xiaohengshan mine between 11:00 and 13:00 on 03 Mar and found SY 1095 working spoil trains while SY 1340 loaded a coal train. SY 0898 was working Erchang again on the same day. By the time we reached Hengshan shortly after 08:00 on 05 Mar, the weather had closed in. Two trains were seen climbing the bank, the first behind SY 0746 and the second hauled by SY 0804, banked by SY 1340 and SY 1095. The bankers then climbed from Zhongxin to Xiaohengshan with most of the wagons. We travelled out to Donghaikuang on the afternoon of 27 Feb. The mine is easily found by going east from Chengzihe on the main road then turning north at the point that the road crosses the line. As we headed north it appeared that the line was climbing from the pit towards the main line but in fact the reverse is true so trains of empties are uphill (and tender first). The mine loaders at Donghaikuang are quite photogenic and although the line cannot be described as scenic, there are numerous pleasant, if unexciting, positions within easy reach of the road. Traffic is not heavy with around two trains in each direction per day. As one of these invariably runs in the middle of the night, there is usually only one train each way in daylight. On the first day we visited, we missed the outbound train by less than an hour and then waited in vain for the locos to return from Jidong with the empties. After three hours there was no sign of them and the sun had set, so we left without even ascertaining which locos were there. Another visit on the morning of 02 Mar found much more activity. SY 0639 was en route to Jidong with a single wagon as we approached the pit around 09:30. SY 1545 then shunted wagons back and forth under the loaders for several hours until a train of around 30 wagons was ready to leave. SY 0639, which had returned from Jidong light engine, then coupled up and waited for clearance to leave. At around 14:30, the dispatcher emerged from the control office with the train orders and token and the loco pulled forward with the train. Anticipating an imminent departure we left for a spot on the line where we hoped to photograph the train. Nothing happened for over an hour. Eventually we gave up in failing light and returned to Jixi. 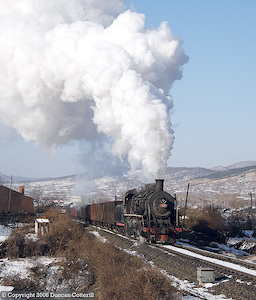 Our 28 Feb visit found three SY in steam at Lishu Xinfeng, SY 0477, 0951 and 1118. SY 1118 took loaded wagons down to the CNR interchange shortly after our arrival at 10:25. At 12:30 SY 1118 set off for the mine at Pinggang with 45 empties banked by SY 0477. At the mine SY 1118 shunted the bulk of the train under the loader while SY 0477 looked after a few wagons that were loaded using a mechanical shovel. SY 0477 returned to Lishu with the first 18 loaded wagons, arriving around 16:00 while SY 1118 remained at the mine to deal with the remaining wagons. Meanwhile SY 0951 had departed Xinfeng at 14:30 with empties for Qikeng mine, returning after about an hour at the mine and waiting above the junction for SY 0477 to pass before completing its journey back to Lishu. While the Pinggang train was composed of the usual CNR wagons, the Qikeng working used a short rake of ancient wooden bodied hopper wagons. Staff at Lishu Xinfeng told us that the mines south of Lishu were closed, leaving Pinggang and Qikeng as the only operational mines on the system. They also said that a quarry at Jianchang, some distance south of Lishu used SY 1078 but we didn't manage to check this out. Our next visit to Lishu was early on 03 Mar. SY 0951 arrived light engine from Pinggang at 07:10 and left again for Qikeng with empties around 09:00, arriving at the mine at 09:15. By 09:45 the wagons were loaded and the train returned to Lishu. SY 0477 was also at Lishu but didn't seem to be doing a lot. A brief visit to Didao Hebei washery on the morning of 01 Mar found SY 0950, 1205, 1213 and 1446 in use. The same engines were there again on the afternoon of 03 Mar. As usual, much of the activity was tender first. The washery didn't appear to be processing much coal but trains of tippers were being dumped at the ramp south of the complex and the coal was then reloaded into CNR wagons for onward movement. Both the shunt onto the ramp to discharge and the working of loaded CNR wagons away from the loading point involved considerable effort from the locos involved. On 04 Mar there was little activity in the afternoon although trains did work to and from all parts of the system. There were also long periods when absolutely nothing happened. The locos in use were the same as on our previous visits. During a dull period on 01 Mar we decided to check out reports of a modern mine west of Didao with 3 SYs. The branch serving it was said to run parallel to the road to Mashan and Linkou. It doesn't exist. There are no active mines west of the Didao system, only the formation of a long disused branch from west of Lanling to the site of a closed mine in the hills and the equally closed mine at Mashan. There has been a change of management here recently and the new regime doesn't welcome foreign enthusiasts. We attempted a visit on 01 Mar and were refused entry. SY 1118, seen the previous day at Lishu, was shunting the yard and SY 0590, from Chengzihe, could be seen in steam outside one of the workshops. On Sun 05 Mar the works was locked up and we were once again unable to get in. No locos were visible. Freight workings on the line between Jixi and Hengshan were seen on a number of occasions. Every train was DF4B hauled and one train was double headed. The Jixi pilot, DF5 2056, was seen banking a heavy coal train leaving Hengshan for Jixi. While waiting east of Jidong for the coal empties to Donghaikuang, an eastbound freight and a westbound passenger were seen, both had DF4B in charge. At Lishu passengers 6423 and N64 were seen with DF4DK while the only freight seen had a DF4B on the front. Several DF8 hauled freights were seen on the line to Linkou, including a number of double headers. Passengers seen were DF4DK hauled. All the DF4DK seen around Jixi were Sankeshu (Harbin) engines. Our attempt to find QJ 6800, previously reportedly plinthed at the depot, was rebuffed by the gateman who confirmed that the loco was there but said we couldn't see it because it was a state secret! However, we drove round to the country end of the depot and looked in through an iron gate, which gave a distant view of the inner yard including QJ 6800 under its canopy. In the outer depot yard a large number of DF4B and DF8 awaited their next duties. These locos, the DF5 yard pilots, DF5 2065 and 2067, and the Hengshan pilot all carried Mudanjiang depot codes. Jixi appears to have no loco allocation of its own these days. QJ 6800 was apparently one of a number of redundant QJs acquired from Harbin Bureau by the Jixi Coal Mining Administration. They were not judged a success in industrial service and didn't remain in use for very long. The only documented sighting of one in service appears to have been Florian Menius's report of QJ 3085 at Hengshan in January 2001. QJ 6800 was "rescued" and preserved at Jixi depot as it was a celebrity loco. We were told that the engine was significant because it had been used by Zhu De but as the loco was built several years after the Marshal's death, this is unlikely. It is possible that the "Iron Bull" decorations had been carried by an earlier loco that had been used by Zhu De and that they had been transferred to QJ 6800 at a later date. It was confirmed that the loco had been a Suihua engine during its CNR service and hadn't been allocated to Jixi. This information came from a member of the depot's staff. Having been assured that the railway would start operating on 15 Feb, we planned a three day visit to follow our stay at Jixi. After arrival in China, we got Xiaolan to check again and specifically asked when the coal trains would start running in case "operating" was misinterpreted. The answer was now 01 March. So far, so good. On 01 March the message came back that trains wouldn't start until 15 March. As a result, we cancelled our visit to Huanan and stayed at Jixi for another three days. We left Jixi on train K412 overnight to Harbin. Motive power was almost certainly one of Sankeshu's DF4DKs throughout. SY 1351 was seen at Jixi Xi. 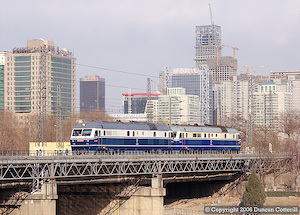 The following morning DFH5 0127, probably in industrial service, was seen at Xiangfang in the Harbin suburbs. The station building at Xiangfang is of interest. It appears to be the original Russian built structure and it has recently been sympathetically restored. 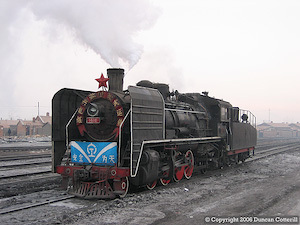 Over the years there have been a number of reports of steam being sighted at various places along the Mudanjiang line east of Harbin but little concrete information had come to light. We spent 06 Mar trying to determine the true situation. First stop was Mao'ershan, some 100 km east of Harbin, where we had seen a steam loco from the parallel expressway several years previously. The loco had been on a line that disappeared through a cleft in the hills east of the station to an industrial site beyond. It turns out that the industrial site is a small ironworks with a rail yard for unloading raw materials. There are no steam locos there now and we were told that the yard is shunted by CNR when required. Local staff indicated that we might find steam working at Weihe or Yabuli! Xiaoling, 20 km to the west has a couple of large cement works. According to staff they were shunted by steam a few years ago but now rely on CNR diesels to do any yard work that is required. The limestone quarries and cement works at Yuquan, 62 km from Harbin, are also now shunted by CNR diesels according to local railway staff. 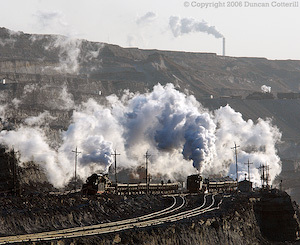 The same staff at Yuquan suggested that we might find steam on an industrial line from Yagou, 52 km from Harbin. The line is extremely photogenic. It leaves the west end of the CNR station and heads south through increasingly hilly terrain for around 22 km to an ironworks at Jiaojie. There we found SY 1588 dumped a short distance from the loco shed. On closer inspection, the loco appeared to be SY 1486 renumbered and we were told that 1588 was a locally applied number. In the shed was SY 1589, recently out of use and intact. In this case, the number appeared to be genuine. Apparently steam had been used until late 2005 when a DFH5 diesel had been acquired. This loco, numbered 1588 (real number unknown) and a 4-wheel railbus were the only motive power currently in use. The shed also contained a small, out of use, (JM110?) diesel loco. In between visits to potential steam locations, a few shots were taken of diesels on the main line. Most passengers had a DF4DK from Harbin's Sankeshu depot on the front and most freights were DF8 hauled, often double headed. A small number of DF4B were also seen. From Harbin, we travelled to Jalainur / Zhalainuoer on overnight train N91. The power ex Harbin was not determined but by dawn we were rolling westward behind an early passenger DF4D. Approaching Hailaer Dong, there were a number of non-CNR coal hoppers in a yard north of the railway. These wagons carried the "mine" crossed hammers symbols rather than the usual "railway" symbols. There was a power station adjacent to the yard and a line disappeared to the north, possibly to a coal mine or mines. No locos were seen but there is an outside possibility that the line may still be steam worked. Passenger trains appeared to be DF4D worked, both east and west of Hailaer. Most freights seen were DF4B hauled and often double headed. A number of freights seen west of Hailaer were DF8B hauled. There were some DF8B double headers and some DF4B + DF8B combinations. DF5 1608 was pilot at Hailaer and orange DF4B 2131 was seen there as well. There was also a line of 6 stored or dumped BJs at the back of Hailaer depot. DF7G 5002 was pilot at Cuogang and there were DF7C pilots at Zhalainuoer Dong. During our stay in the Manzhouli / Zhalainuoer area, all the freights we saw had DF4B or DF8B power, sometimes double headed and sometimes one of each class. All the locos appeared to be based at Manzhouli but as the depot character was a bit stylised and difficult to reconcile against the characters in the name Manzhouli, I'm not absolutely certain of this. All the passengers seen were DF4D powered, usually with locos from the same depot in the low DF4D 01xx series. 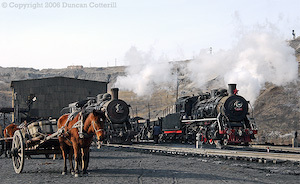 Since the demise of Jingpeng Pass, this is probably the greatest steam spectacle left in the world with 30 active locos and up to 20 steam worked trains visible in the mine at any one time. As expected, we found virtually everyone very friendly but we did have permission to be there. Compared to March last year, there were more spoil workings and less coal trains. For half of one day and virtually all of another, no coal was being moved at all, probably due to a shortage of CNR wagons at the washery. Overall, the number of locos in use was greater than last year. Unfortunately, the weather was much worse than last time. The first day here was sunny but a bit hazy, the weather on the second day was very hazy while the third day was totally overcast. The light did improve on the final day but with no coal moving and a strong north westerly wind blowing, it was mid afternoon before we got any worthwhile shots. The wind made photography difficult on most mornings. We were also hampered by the presence of a film crew making yet another film about the period of Japanese occupation. They didn't even bother to disguise the SY as JF6, very slapdash! The railway has a well equipped workshop where all but the heaviest overhauls can be carried out. SY 1119 and SY 1681 were being worked on during our visit with other locos visiting for minor work such as valve and piston exams and boiler washouts. SY 0795 was undergoing minor repairs during one of our visits. This loco bears a 1978 Tangshan builders plate instead of the 1974 one expected. Tangshan works was undergoing rebuilding after the 1976 earthquake at this time, so where the plate came from is a mystery. A couple of the more modern engines seen recently appeared to be missing and may have been at works. The restrictions applied to steam working over designated "high speed" lines in north-west and central China don't seem to apply yet on secondary routes in the far north east. This operation seemed much busier than last March with more coal traffic emanating from the deep mines than from the opencast pit. According to the figures we saw, approximately 65% of the total coal output comes from the deep mines, about half of it from Taibeikuang pit, north of the main line, and the rest from Shierjing and Sanjing mines, to the west of the opencast pit. Sanjing is the pit marked as "new Shiyijing" on Florian's excellent map. Unfortunately this isn't a particularly photogenic operation, particularly when there's a strong north-westerly wind blowing. SY 1416 is worth a picture though. It is equipped with full smoke deflectors, giving it a distinctly SL like appearance. The other locos were of standard appearance except for dumped SY 1688 which was paired with a JF tender tank mounted on an SY tender chassis. This tender was numbered SY 1688 on the back. The damaged remains of the original tender tank were on the ground alongside the loco. One dull afternoon when we were desperately trying to think of something useful we could do, our driver suggested a visit to the Russian border, west of Manzhouli. It wasn't the first place we would have thought of but we decided to give it a try. Adjacent to the rail border crossing we found JF 1861 plinthed close to a MiG jet fighter. While there, we saw two cross border freight trains hauled by Russian 2TE10V twin unit diesels. At the transhipment yard west of Manzhouli a DF7C was seen from a distance. Whether this was standard or 5 foot gauge was not clear. There was no sign of the 5 foot gauge BJs previously reported here although we didn't look particularly hard for them. We travelled back to Harbin on train N92 at 18:55 from Zhalainuoer Xi. DF4D 0509, a Qiqihaer loco, was on the front from Zhalainuoer and another, unidentified DF4D took us on the last leg into Harbin. The loco change was probably at Qiqihaer where the train reversed. At Harbin, we transferred to the airport for an onward flight to Beijing. Although no Saturday flight from Hailaer had been advertised, there was one on the arrivals board when we got to Beijing. If we'd known about it, we could have saved an overnight journey and flown from Hailaer instead. It also appears that there is an airport at Manzhouli but I haven't seen any reference to it elsewhere. We saw a China Southern jet on its approach over Zhalainuoer one morning so there may be some useful flights from there as well. It was originally our intention to go to Luopoling on the 11th for some modern traction photography but the weather was looking dodgy and by the time we were clear of the airport, there wasn't really enough time anyway. Instead, we returned to the Dongnan Jiaolou, near Beijing station. The quantity and variety of motive power was nothing like as great as that seen during our morning visit and there were long periods of inactivity. Locos of classes DF4B. DF4D, DF7G, DF11 and SS9G were seen during the hour or so that we were there. Afterwards we continued to the Echo model shop before rounding off the day nicely with the customary Beijing Duck dinner. Our last day started with a short visit to the Beijing Railway Museum. There were no new exhibits but the existing locos had been shunted around a bit. We were greeted at the airport by a notice informing us of a two-hour delay to our return flight. For Jim and Peter that meant a very late arrival back in the UK. For Bryan and me an overnight stay in Paris was required, courtesy of Air France. In spite of having to endure the chaos of Paris CDG, it all went reasonably smoothly in the end. Chinese steam may be disappearing fast but the show isn't quite over yet. Jixi and Zhalainuoer are both top class operations with lots of engines, plenty of activity, dramatic locations, and bags of photographic potential. I would have no hesitation in recommending anyone who hasn't been to pull out all the stops to visit these locations while it's still possible. Once they're gone, you will never ever get another chance. Meihekou was disappointing due to the poor weather. While the presence of the diesel was annoying and made life more difficult, there would still have been enough freight activity to photograph if only the sun had been out. After two autumn visits to Huanan, it would have been good to see the line in winter but it was not to be. We asked all the right questions and still got the wrong answers until the day before we were due to go there. Fortunately, we had a plan B and were able to replan our itinerary with a minimum of disruption. It seems that the railway starts operating around two weeks before the coal trains start running. During this period the track is repaired and the snow cleared. Mike Ma confirmed this when we met him at Zhalainuoer. With most of the remaining steam operations rapidly going over to diesel the future is far from bright. It's already getting difficult to put together a viable itinerary to the remaining steam centres that doesn't involve enormous mileages and long periods of travelling. And this can only get worse as time goes on. Some people may be content to visit the "one SY shunting the occasional wagon" type operations but I'm not one of them. Although I much prefer scenic locations, I'm more than happy to spend time on quality industrial lines such as Jixi, Huanan, Zhalainuoer, Shibanxi and Sandaoling but it's difficult to think of many others that are still worth visiting. A scenic diesel or electric worked main line is a far more tempting proposition than a poor steam location. This certainly won't have been my last visit to China but I don't expect steam to play such a large role in future trips. It's often said that you see far more of interest travelling by train than flying but that's not always the case. If we hadn't flown back from Harbin, we wouldn't have seen some remarkable evidence of China's awakening to the fascination of steam. Chinese in-flight magazines often contain photography of a very high standard and March's CAAC mag was no exception. The front cover featured a pair of QJs curving into the Erdi Valley and inside was a six page, lavishly illustrated, article on steam. Like so many other nations, China seems to be discovering steam just too late to see it at it's best.